Book Yourself To The Max !!! We also accept pay pal & billpoint. Allow 2-3 weeks for these hand manufactured tables. This Page Is Being Updated. Pictures Will Be Added Soon. You May However Still Purchase Any Item On This Page During The Updating Process. The X Table - This is a truely beautiful side table that comes apart for easy transport. It's beautifully decorated in red and black with gold trim for a real classy look. It looks gorgeous on stage. It breaks down into three light weight easy to carry sections. but where will I put all these pieces? you may ask. Not to worry, it comes with it's own custom carrying bag. Yes, I to have had beautiful tables only to find that they get all scratched up when I put them into the car. The bag completely covers the table and has compartments for each piece to keep them from rubbing together. $59.95 post paid. 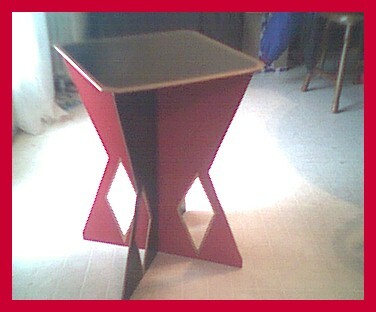 Buy It "The furniture in the background doesn't come with it"
The V Table - This is a very classy looking side table. It's decorated in black with gold trim. from the front it resembles a V shape, hence the name. It's all self contained with no extra pieces to carry around or leave behind. IT ALSO COMES WITH A CUSTOM BAG TO KEEP IT FROM DAMAGE RIDING AROUND IN YOUR TRUNK. This really looks professional on stage and will set you a part from the competition. Rabbit Out Of Hat Side Table - This is a great children's show table. It has a bright colored rabbit popping out of a top hat painted on the front. It's all self contained. Once again no extra pieces to carry or accidently leave behind. You'll just love this table. As always it comes with a bag to protect it from the wear and tear many performances will put on it. Allow 2-3 weeks for hand made items listed above.